Blogging has now become more than just sharing thoughts these days. But very few of us know that it can also be counted as another source of income. If optimized sensibly, it could bring a significant amount of money to your accounts. While many people are blogging on the internet, only a few of them succeed to run a booming and earning blog. Do you know the reason behind it? It’s not a secret, but to gain cash from the blog just needs series of step by step instructions to be followed seriously. First thing first, decide what subject you want to write about. There are hundreds of bloggers creating millions of words content every day without earning anything, just because they had chosen wrong niche or stream. A person needs to be passionate about something to write about it if you are just looking for quick cash with blogging, this won’t happen any sooner. So the rule of thumb here is -Choose a niche and stick with it. One of the most important components of your blog is the name. It should be catchy and easy to remember. Don’t use the extra hard words in the title. The more simple and relatable blog name is, the more Google search friendly it can become. Also, you need to be careful about not to choose a brand name or the tagline for it as it could end up as suspension of the blog. This dilemma haunts every new blogger when they first reach the conclusion to start a blog. There are both advantage and disadvantage of free and paid blogging. So as it was mentioned above, free blogging may look great at the beginning, but in the end, a blogger may not earn a penny out of it. If you are seriously in to earning money and start a professional blog, it’s advisable to buy a domain name first. Domain name is simply the website name with .com or .in or any other extension. There are more than 450+ domain extensions to choose from. There are many websites like big rock and GoDaddy which are selling the domain names in less than 5$ to 10$ per year. Domain and hosting go hand to hand. Hosting helps the user to reach your blog via the internet. Hosting is required along with domain to get the website up and running. There are many hosting platforms on the market. You need to choose a blogging platform also; the blogging platform is software or service, where blogger makes content which they can later put on their blog. Right now WordPress covers more than 65% market and they have a very user-friendly interface to manage everything. Now when you have set up your blog and ready to trade in the uncharted territory of blogging, one thing still remains eminent and that is- CONTENT. As you must have heard before, content is the king. No matter how beautiful your blog design is, the user needs data, or we can say useful data which they can read and use and later implement. It depends on your niche that what kind of content you want to put into it. You need to create useful content so that your reader can read and explore the blog. Content should be unique in manner and also valuable from which they can get a feasible answer or solution to their problem. Blogger should create a friendly environment for their blog. Give a reply to everyone who comments on your blog and appreciates their effort. 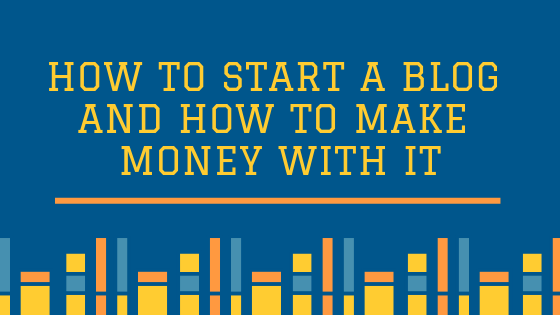 Creating a wide readership is one of the steps to make money. A blogger needs to make a community which is of their recurring users and offer to those the valuable help and guidance so that they can come back later. In the era of social networking, one needs to spread the word by using every single social media platform available. You need to make a Facebook page, Instagram, twitter account and other social media accounts. Share your latest posts on social media and see the reactions. That way you can understand the trend and response of the reader. Affiliate Marketing: When a buyer comes to your blog looking for some relevant information and land into your specific page, then you can place some related links there that may be of interest to your reader. The further activity of your reader, buying the product and proceeding to the marketplace from the link given by you, will make you earn commission on that. It could be as little as 1$ or 10000$ based on the product you choose. AdSense: One of the hardest but reliable way to get money is from Google itself. Google Adsense program is a simple advertisement on your blog related to the content you have put on it. When a reader clicks on the ad, you earn money. As simple as it sounds, it’s all CPC (cost per click). The more CPC you have, more money you can earn. For Ex, if you have 100000 impressions on your blog, mean 100000 visits per month, it can be easily estimated that out of that, 1% would have clicked on the ad. Now if your CPC is 0.10% then you could earn 10$ if it’s 1$ than you can earn 1000$. CPC is based on the niche and demography of the user. Paid review: Paid review is also one of the best ways to generate income. Once you establish yourself as a professional blogger and start getting a reasonable amount of traffic, you can write a paid review on the price you demand. Selling EBook: Creating and selling eBooks are also one way to earn money. You can create an eBook from your content and sell it on Amazon or on your blog. It’s easy and you don’t need anything rather than your own content. Services: You can sell the service which you can offer to your reader. If your website developer, you can create a beautiful website and it offers your service to them. It also includes content writing, SEO, tutorial building etc. This the direct way to sell anything which you are good at and earn extra money. More than anything, you need to keep calm and keep writing. You cannot earn overnight, it takes time and lots of hard work. But once you get into the habit of it, you can easily earn the realistic amount of money in no time.